Incident ray, reflected ray and normal all lie in the same plane. Most common type of curved mirrors are spherical mirrors. Mirrors in which reflecting surface are spherical in shape, is known as spherical mirrors. Reflecting surface of a mirror can be curved inwards or curved outwards. The one which is curved inward is known as concave mirror and the one which curved outwards is known as convex mirror. Pole- The centre of the reflecting surface in a spherical mirror is a pole. It is represented by P.
Centre of curvature- Reflecting surface in a spherical mirror has a centre, this is known as centre of curvature. Centre of curvature in convex mirror lies behind the mirror whereas in concave mirror, it lies in front of the mirror. Radius of curvature- The radius of the reflecting surface of the spherical mirror is known as radius of curvature. It is represented by R.
Principal axis- Straight line passing through the pole and centre of curvature in a spherical mirror is known as principal axis. Principal focus- The reflected rays appear to come from a point on the principal axis, this is known as principal focus. Focal length- The distance between the pole and the principal focus in a spherical mirror is known as focal length and it is represented by f.
Aperture- The diameter of the reflecting surface is defined as aperture. Note: Radius of curvature is twice the focal length (R=2f). A ray parallel to the principal axis should pass through the focus after reflection in case of concave mirror, or appear to diverge in case of convex mirror. 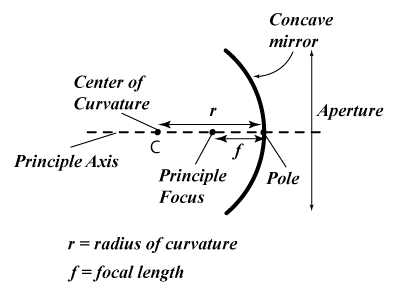 A ray passing through the focus of the concave mirror or directed towards the focus in case of convex mirror, should appear parallel to the principal axis after reflection. 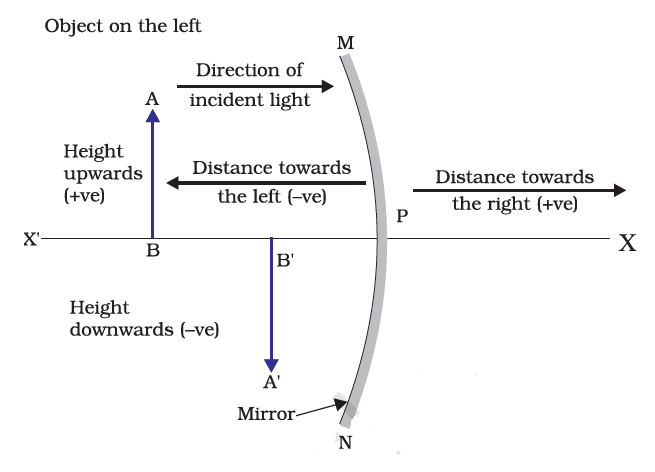 A ray which is passing through the centre of curvature in a concave mirror or directed in case of convex mirror, should reflect along the same path. A ray when incident obliquely to principal axis on a concave or convex mirror is also reflected obliquely. 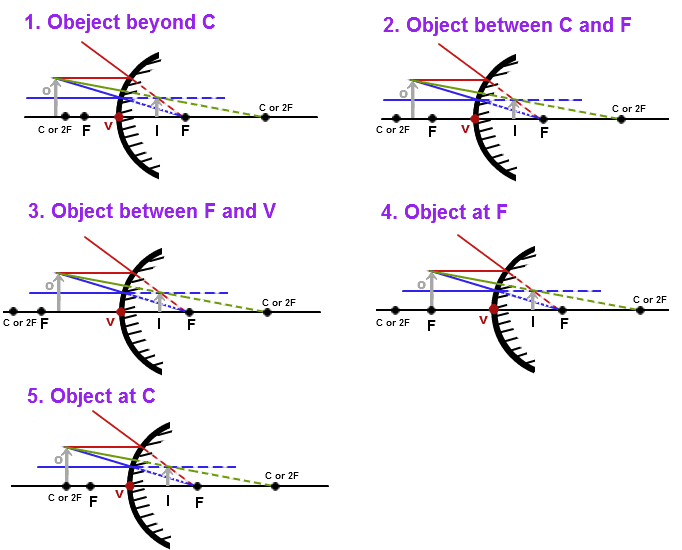 Position, nature, and the size of the image formed by a concave mirror is dependent on the position of the object in relation to P, C and F. Image formed can be real or virtual. The image can also be magnified, diminished or even of the same size. Used in search lights, torches, head lights of the vehicles. Also used in shaving mirrors. Used by dentists also to see larger image of the teeth. Other use in solar furnaces. They are used as rear-view mirrors. They are used to see the traffic behind. They are preferred as they give erect but diminished image. 1. The object is always placed to the left of the mirror. 2. All distances parallel to the principal axis are measured from the pole of the mirror. 3. All the distances measured to the right of the origin (along + x-axis) are taken as positive while those measured to the left of the origin (along – x-axis) are taken as negative. 4. Distances measured perpendicular to and above the principal axis (along + y-axis) will be taken as positive. 5. Distances measured perpendicular to and below the principal axis (along –y-axis) will be taken as negative. It is applicable for spherical mirrors in all positions of the object. It is defined as relative extent to which an object is magnified in comparison to its object size. Where m is the magnification, ho is the height of the object and hi is the height of the image. However, it is to be taken as negative for real images. A negative sign in the value of magnification indicates that the nature of the image is real. A positive sign in the value of the magnification indicates the virtual nature of the image. Bending of the light rays as it passes from one medium to another medium is known as refraction of light. Incident ray, refracted ray and normal all lie in the same plane. The ratio of sine of angle of incidence to the sine of angle of refraction is constant. This law is also known as Snell’s law of refraction. When light passes from one medium to another medium, it changes its direction. 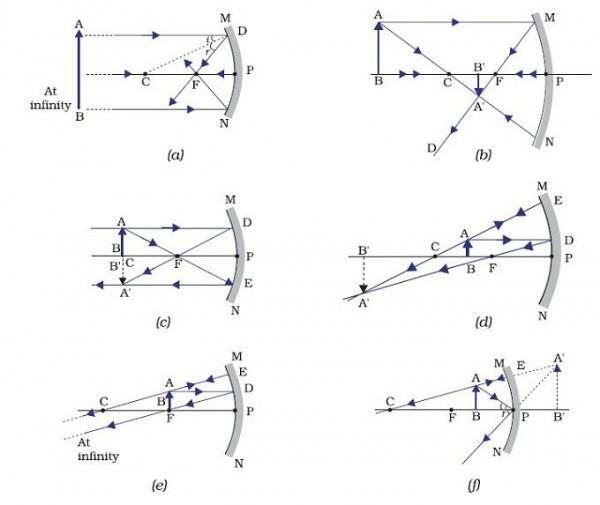 The extent to which the direction changes is expressed in terms of refractive index. The value of refractive index is dependent on the speed of light in two media. v1 is the speed of light in medium 1 and v2 is the speed of light in medium 2. The refractive index of medium 2 with respect to medium 1 is represented as n21. If medium 1 is vacuum or air, then the refractive index of medium 2 with respect to vacuum is known as absolute refractive index of the medium. Where c is the speed of light in air, v is the speed of light in other medium and nm is the refractive index of the medium. Lenses are defined as transparent materials which are bounded by two surfaces, out of which one or both can be spherical. When both the two spherical surfaces bulge outwards, it is known as convex lens. They converge the light rays. When the two spherical surfaces bulge inwards, they are known as concave lens. They are known as diverging lens. The centre of these spherical surfaces is known as centre of curvature, represented by C.
Any imaginary straight line passing through the centre of curvature of a lens is known as principal axis. The centre point is known as optical centre. The effective diameter of the spherical lens is known as aperture. 1. A ray of light which is parallel to the principal axis will pass through the principal focus after refraction from the convex lens. 2. A ray of light passing through principal focus, will emerge parallel to principal axis after refraction from the convex lens. 3. A light ray passing through optical centre will emerge out without any deviation. Sign convention are used as similar for spherical mirrors. But the focal length of a convex lens is positive and that of concave lens in negative. 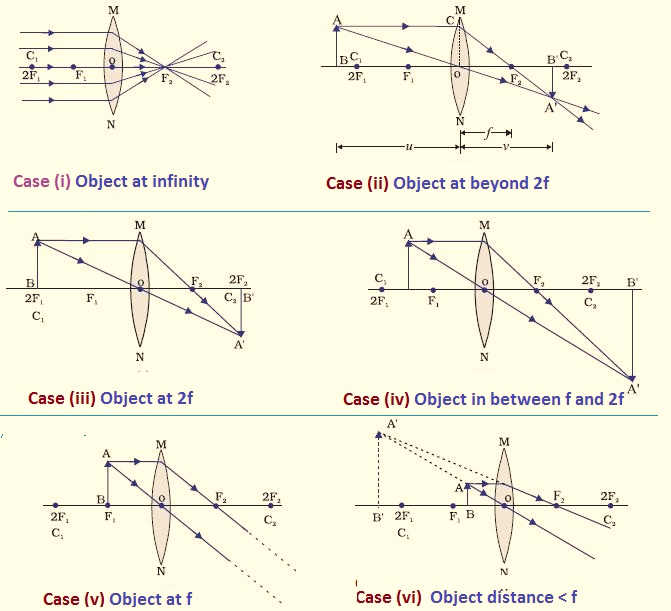 Where, u is object distance, v is image distance and f is focal length. The ratio of the height of an image to the height of an object is defined as magnification. Magnification is represented by m, h0 is the height of the object and hi is the height of the image. The SI unit of power is dioptre. It is represented by D. Power of concave lens is negative and power of convex lens is positive.